For renters, it’s a dilemma as old as time: should I spend more to live alone or should I save money by living with a roommate? Living alone has its perks. You never have to wait for the bathroom, dishes don’t mysteriously stack up in the sink and you can watch whatever you want on T.V. So, while some people don’t mind having a roommate (and some even enjoy it), most renters would prefer to have their own place. Read the 2016 version of this annual study. The problem is, renting on your own can be very expensive. Call it the solitude premium. SmartAsset’s analysis found that in some major cities, renters who split a two-bedroom with a roommate save more than $800 a month over those who rent a one-bedroom on their own. To calculate the savings for renters who live with a roommate, SmartAsset looked at average rent for two-bedroom and one-bedroom apartments in the 50 largest cities in the U.S. Our rental data comes from myapartmentmap.com, which has hundreds and sometimes thousands of listings in each of the cities we analyzed. We assumed that roommates living in a two-bedroom would split the rent equally. We then calculated the difference between the two-bedroom rent divided two ways and the rent on a one bedroom. As a simple example, suppose the average monthly rent for a two-bedroom in a certain city is $2,000 and the average rent on a one-bedroom is $1,250. The average savings in this case would be $250. That’s $1,250 – ($2,000 / 2). Another way of thinking about this number is the premium a renter would have to pay to live alone. Try SmartAsset’s super-smart rent-vs-buy calculator. The $700 Club. 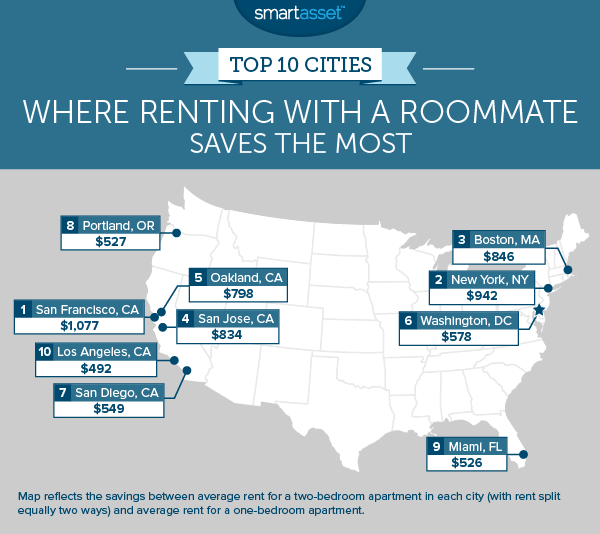 Five cities offer average roommate savings in excess of $700 per month: San Francisco, New York, Boston, San Jose and Oakland. In San Fran, the savings can be over $1,000. Bay Area: roommate required. Three of the five cities with the highest savings for renters with roommates are in the San Francisco Bay Area, where the tech boom has pushed rents into the stratosphere. According to data from myapartmentmap.com, the average rent on a one-bedroom apartment in San Francisco is $3,530 per month. That’s $42,360 annually, which is equal to about 80% of the median household income in the United State and 56% of median household income in San Francisco itself. 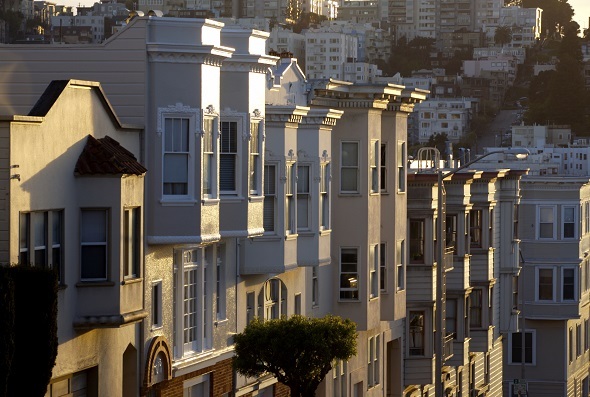 In other words, most San Franciscans can’t afford to live by themselves. Having a roommate (or several) is therefore not an option, it’s a requirement. Renters who split a two-bedroom in San Fran would save about $1,077 a month as compared with renting a one-bedroom on their own. Renters in New York – and especially in Manhattan – are all too familiar with the sacrifices required to achieve affordable rent. It is not uncommon for two people to split a one-bedroom by partitioning off the living room, or for five people to squeeze into a three-bedroom apartment by turning a closet into an extra bedroom and sticking a bunk bed in another. Moving to NYC? Find out how much house you can afford. The rental data we looked at demonstrates why New Yorkers are willing to jump through such hoops. Simply downgrading from a one-bedroom to a two-bedroom split two ways will save an average of $942 per month, on average. That’s $11,304 annually, the entire cost of rent in many other cities. According to Zillow, home prices in Boston have increased by 8.1% over the past year. Rents, meanwhile, have stayed relatively flat. One possibility is that high rental rates are pushing more people toward buying instead of renting. Indeed, for those who want their own place, apartments in Boston can be prohibitively expensive. Average rent on a one-bedroom in the city is $2,260. On the other hand, someone living with a roommate in an average two-bedroom apartment would pay $1,414, saving them $846 per month. Though San Jose is at the heart of Silicon Valley, the city’s rental market is not quite as competitive (or some might say, insane) as the rental market in San Francisco. Nonetheless, renters in San Jose can save over $800 a month on average by shacking up with a roommate in a 2-bedroom apartment. The East Bay is feeling the effects of the region’s housing boom. According to Zillow, the housing market in Oakland is “hot” and average rental rates have climbed by over $500 since last year. Renters in Oakland who could once afford their own place may soon have to find a roommate. Switching from a one-bedroom to a two-bedroom split two-ways would lead to average savings of $798 per month. According to researchers at NYU, the population of renters in Washington, D.C. increased by 22% between 2006 and 2013, far outpacing population growth. It’s safe to say that many of those new renters are sharing space with roommates. The average market rent for a one-bedroom in Washington, DC is $1,966, according to myapartmentmap.com. That’s nearly $24,000 a year. The cost of splitting a two-bedroom with a roommate for year, meanwhile, would be $16,656, representing savings of about $7,000 per year. A monthly one-bedroom apartment rental in San Diego costs $1,571 on average, making it about 70% more expensive than the median of the 50 largest cities in the U.S. At that rate, it will likely still make financial sense for most renters to share space rather than live alone. While Portland isn’t quite as expensive as many of the other top cities in our study, renters who choose to live alone still pay a high premium in the City of Roses. That’s because the average monthly rent on a two-bedroom apartment is only $300 more than the average rent on a one-bedroom. With its reliably warm weather and dazzling beaches, Miami is an attractive choice for northerners thinking about relocating. Those doing so might want to bring a friend. Our analysis found that renters splitting a two-bedroom apartment in Miami would pay an average of $983 a month, compared with $1,508 monthly for a one-bedroom. Though Los Angeles rates among the most expensive cities in the U.S., renters living in the city of L.A. don’t save quite as much by taking on roommates as they do in places like New York and San Francisco. In L.A., as in those cities, average rent on a two-bedroom apartment is more than $3,000 per month. A one bedroom, on the other hand, is close to $2,000 per month. Read the 2016 version of our study on roommate savings across the country.